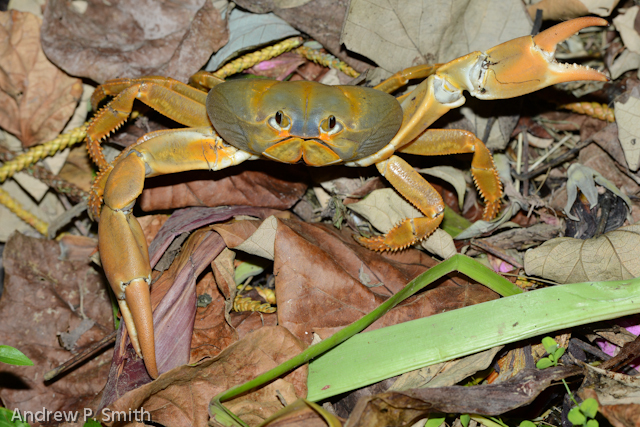 On Thursday I discovered something new about my community of Cascade – crabs live there. This should not be a surprise to me as this section of Jamaica’s Blue Mountains has high biodiversity and many rivers and streams abound, but the fact is I’ve never seen them – certainly not the size of the one I saw in my driveway that evening just before sunset. 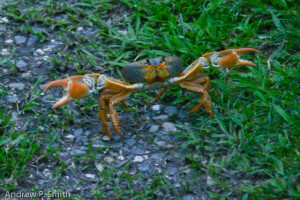 Although I do live in close proximity to two rivers, I didn’t think that I’d find a crab in my driveway, although my caretaker Artie told me that he has seen crabs as roadkill, and young boys in the community apparently play football with them. So I am inside, working hard on my paper when I am called outside by Artie who asked, “you see anyt’ing like this before?” When I saw it, I had to admit – no, not in my yard. It was actually a very pretty orange/brown colour, but what caught my attention (apart from the size) were the very serious looking claws in the “touch me if you bad” position. Me, I just wanted to shoot it – first with the 24-120mm which was too short, then I switched to the 70-200 f/2.8 which suited me fine. I managed to get a series of shots as it walked from the middle of the driveway, against the wall until it disappeared into the leaf litter at the end of the wall. All the while brandishing his claws. Needless to say, from now on I will NOT by pushing my hands into any leaf litter or holes in the ground around my yard.